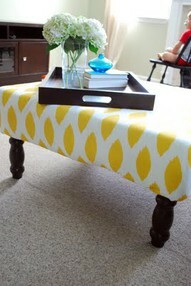 Ottomans are not the cheapest piece of furniture out there, so why not try out a cheap alternative. Buy a coffee table with unique legs, add a big piece of foam, and pick out amazing fabric to place on top as though you are covering a chair seat. Such a perfect option when you are looking to find the fabric that fits!